To be able to perform calculations, you must specify a set of gamma-energies of interest (in keV). The set of energies represent the chosen gamma-energies for which Angle will calculate effective solid angles and full-energy peak efficiencies, which is the ultimate goal of the software. An energy set can be defined using the button “Edit energy set” on the “Additional parameters” tab on the ribbon. Another, more flexible way, to define the energy set is using the pop-up menu, which you can open by clicking the “Energies” label. The energies pop-up menu contains two additional options. One is “Load saved energies...” which opens a dialog to find an energies file to load. The other one named “Saved energies” opens a sub-menu with the list of all the saved energies, from which you can select any previously saved one with just one click. The “Saved energies” sub-menu is automatically populated with all saved energy files from the default energies folder. By clicking the “Edit energy set” button or the pop-up menu option, the energy set dialog will be shown. The dialog will display current energy set by default. From here you can change the set, enter a completely new set, or load a previously saved one from a disk. To enter a new set of energies, just click on a “New set” button and specify the number of energies in the set. Then, populate the table with energy values (in keV). Finally, give a name to the energy set. 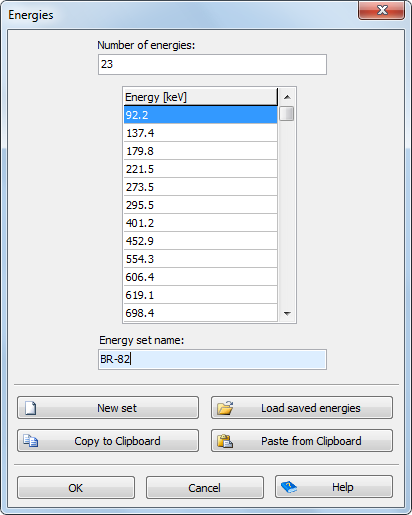 The whole energy set can be copied to or pasted from the Clipboard using the “Copy to Clipboard” and “Paste from Clipboard” buttons, respectively. After clicking the “OK” button you will be prompted if you would like to save the energy to a file for future use. You can load a previously saved energy set by clicking on the “Load saved energies” button and choosing an energy file. You can also load energies from files with saved calculation parameters or calculation results. You just need to choose the appropriate file type in the file selection dialog.